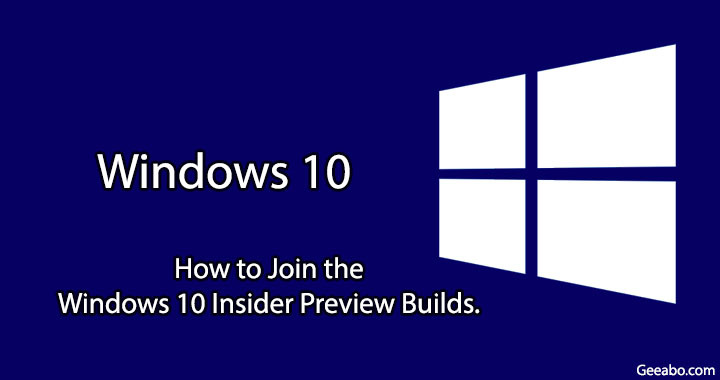 This article of Geeabo teaches you How to Join the Windows 10 Insider Preview Builds. What is Windows Insider Program? Windows 10 Insider Program is an open testing program by Microsoft that allows you to get the latest builds of Windows 10. And this Insider Program can use only those who own a valid licence of Windows 10. Simply follow the below steps to join the Windows 10 Insider Preview builds. #1. Go to Settings or press “Windows Key + I“. #2. Click on Update & Security. #4. Here you can see some instructions, simply read it and Click on Get started button. #5. Here you can see Link an account under Choose an account to get started option, simply click on that. #6. After click on Link an account it will open a new window, here just choose the account from which you want to join the windows 10 insider preview. #7. Now it will ask you What kind of content would you like to receive? Just send me early updates – If you want to receive the latest builds as soon as then select this one. Now select any one of these and click on Confirm. #8. After click on confirm this will open a new window “A better window for everyone” with some important instructions. #9. Now done, this will give you a message that Thanks for participating Windows Insider Programme! We need to restart your PC so that you can get Insider preview builds. So this was the whole process to Join the Windows 10 Insider Preview Builds. Hope you guys like this article about How to Join the Windows 10 Insider Preview Builds and you have learned something new with the help of this article. Please Do Like, Comment and Share our articles if you really appreciate my work.